Click on the thumbnail photograph or underlined text to see the picture in greater detail. Links will work faster if you allow the entire page to load. Structure B is located at the North end of this hill-top site, bordering the North Plaza. The famous "Battle Mural" is located below the porticos of this building on either side of its central staircase. The murals were therefore on the outside of this structure, and were meant to be viewed by those standing in the North Plaza. The "Battle Mural" is a possible misnomer for this bloody scene. While it may at first seem like a battle, with the Jaguar Warriors slaughtering the Eagle Warriors, the scene is actually one of sacrifice. The vanquished Eagle Warriors are mostly naked and relatively unarmed. This is probably a scene depicting the sacrifice which followed a great battle. Click on the picture to view the mural in a sequence from left to right (west to east). These murals decorate either side of a large doorway into Building A. They depict two elite figures dressed in Eagle and Jaguar costumes. 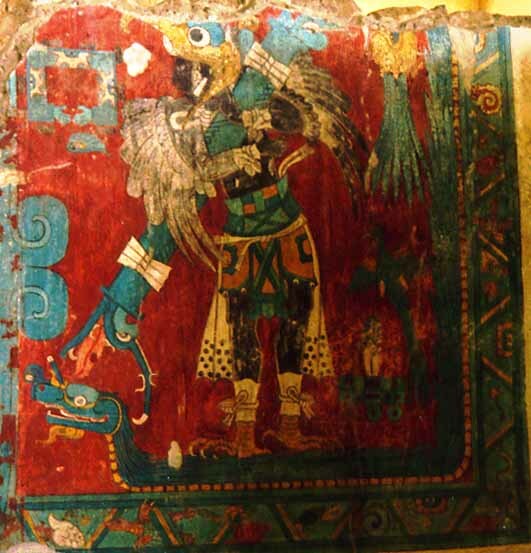 The man dressed as a bird stands on a feathered serpent and carries a large serpent bar. Follow the link at the bottom of the next page to view the man dressed as a jaguar, who stands upon an elongated jaguar body. They both are surrounded by water imagery, and may be named in a style typical of Central Mexico. Stair mural from the Red Temple. 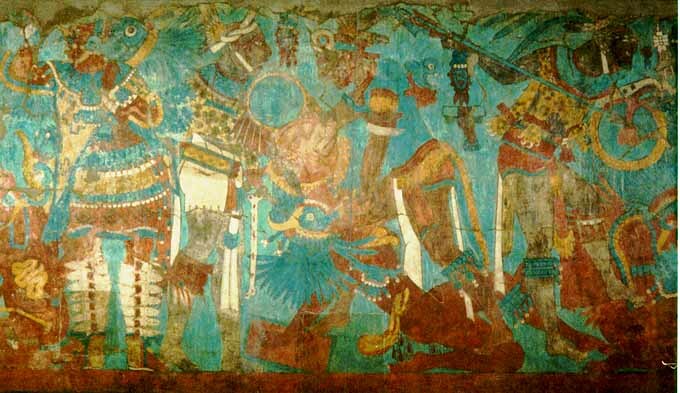 This scene depicts an old merchant (possibly dressed as the Maya God L, god of the underworld and closely associated with merchants) who has set down his backpack. His name is painted above his right hand as "4 Deer", written in a style typical of Central Mexico. The man wears a Jaguar headdress, has a jaguarian face, and has paws for feet and hands. 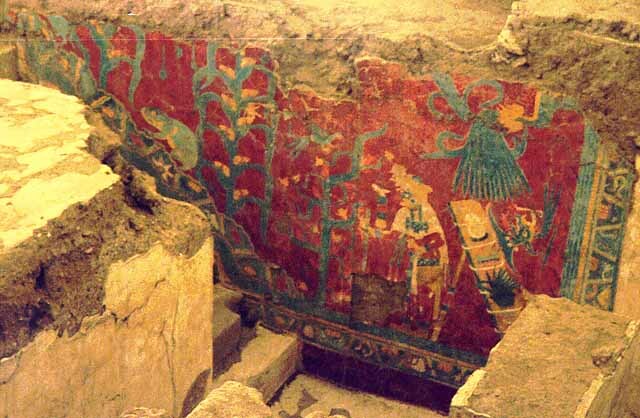 He stands upon a feathered serpent body, which is in turn upon a band filled with water imagery. Up the "hill" or stairs, there are mature cacoa and maize plants. The ears of corn are depicted as human heads. A toad is depicted half-way up the hill. There is more to Cacaxtla than just the beautiful murals. Here archaeologists have found rabbit pens, proof of the diet which was available to the elite who lived at the hill's summit. 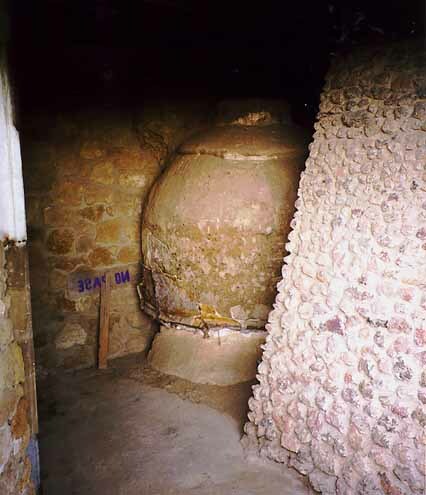 This cuexcomate is hundreds of years old, but this style of granery is still used by some farmers in the region today. The entire exterior is covered with daub which prevented pests from reaching the season's harvest, and the top is capped by a ceramic "lid". 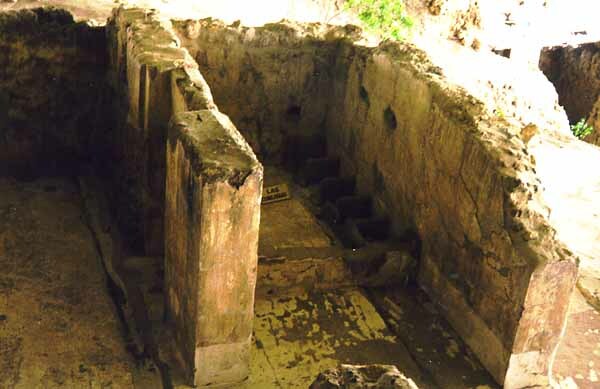 If you ever find yourself at the archaeological site of Cacaxtla, take a walk around the Great Platform. This partially artificial summit contains layers upon layers of prehistoric occupations. 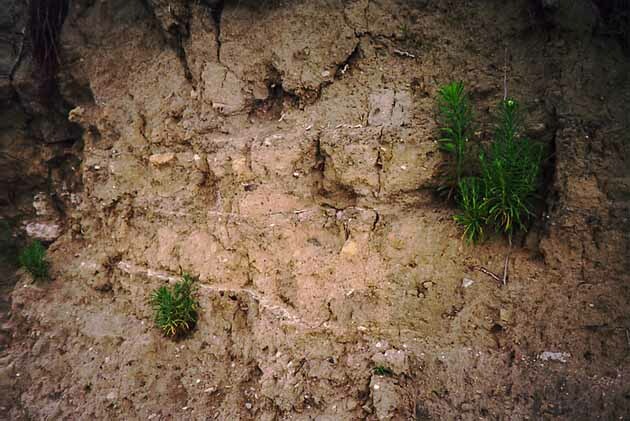 In this profile you can see three plaster prepared floors which were uncovered when a road was cut, I assume to allow locals to pass by the archaeological site.